A grand jury has decided no felony crime was committed by the sheriff’s office or jailers in the treatment of a black woman who died in a Southeast Texas county jail last summer. 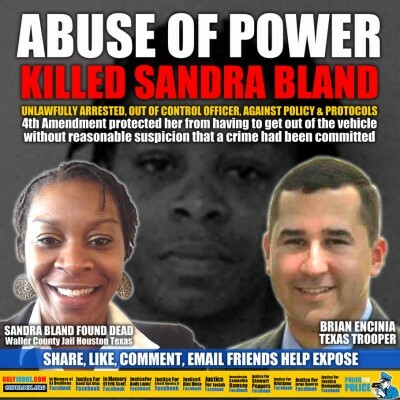 But prosecutor Darrell Jorden says the Waller County grand jury on Monday reached no decision on whether the trooper that arrested 28-year-old Sandra Bland should face charges. The grand jury will return in January to consider that. The Chicago-area woman was pulled over July 10 by a Texas state trooper for making an improper lane change. Authorities contend the stop became confrontational and a video of her arrest shows a state trooper kneeling on top of her as she is facedown on the ground. She can be heard saying that the trooper slammed her head to the ground and that she could not hear. She was arrested for assault. Bland was taken in handcuffs to the county jail in nearby Hempstead, about 50 miles northwest of Houston, and remained there when she couldn’t raise about $500 for bail. [She appeared to be having difficulty contacting her family.] 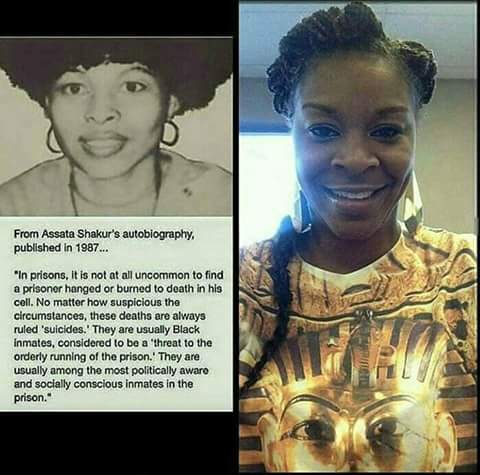 She was discovered dead in her jail cell three days later, hanging from a cell partition with a plastic garbage bag used as a ligature around her neck. Other media reported, falsely, that Bland should have followed Encinia’s orders. Even the Michigan Supreme Court last year upheld the “common law right” to resist illegal conduct and arrest by law enforcement officers. Bland’s relatives, along with supporters fueled by social media postings, questioned an official autopsy finding that Bland killed herself. Grand jurors considered evidence collected by a team of five special prosecutors named by the county’s district attorney, Elton Mathis. “Having an independent committee to evaluate the case, that can be a positive thing in a situation like this,” Brian Serr, a law professor at Baylor University said. Waller County DA Elton Mathis (center) with former prosecutor Lewis White (l) and attorney Darrell Jorden (r). Among evidence presented in the secret grand jury proceedings were the findings of a Texas Rangers’ investigation. “There’s nothing in there that shows anything happened but she killed herself,” Mathis had said. 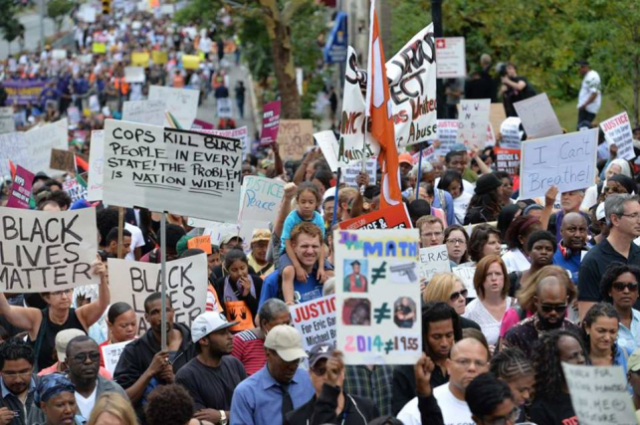 Bland, 28, of Naperville, Illinois, had become an online supporter of the Black Lives Matter movement before she was arrested, according to the Chicago Tribune. 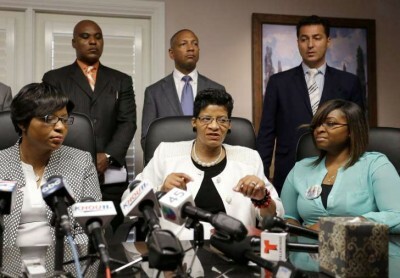 At a news conference earlier Monday, the family of Bland said they do not believe her case is being thoroughly investigated by the Texas Rangers or properly presented to a grand jury by special prosecutors, the Tribune reported. 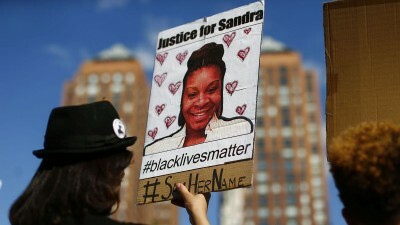 Her death came amid increasing scrutiny across the nation over police treatment of African-Americans after the deaths of unarmed African-Americans by police, including Michael Brown, Tamir Rice and Eric Garner. None of the officers involved in those cases have been charged. Bland’s mother, Geneva Reed-Veal filed a federal lawsuit against the arresting officer and others connected to the case, according to local news reports. 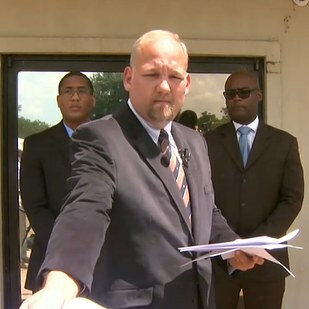 The targets of the suit include the state trooper Brian Encinia who pulled over Bland, the Texas Department of Public Safety, screening officers at the Waller County jail, and Waller County itself. The Bland family attorneys contend Waller County jailers should have checked on her more frequently and that the county should have performed mental evaluations once she disclosed she had a history of attempting suicide. In her lawsuit, Reed-Veal also contends that Encinia falsified the assault allegation to take Bland into custody and that jail personnel failed to keep her daughter safe. Encinia, who in June completed a year-long probationary stint as a new trooper, has been on administrative duty since Bland’s death. This entry was posted in Uncategorized and tagged Beatbackthebullies, blacklivesmatter, blacklivesmatterDetroit, JailKillerCops, PoliceState, PrisonNation, SandraBland, SandraBlandwasmurdered, StopPoliceMurders, StopWaronBlackAmerica. Bookmark the permalink.